Biofreeze is the seriously cool answer to pains, aches, strains, hot flashes and is ideal for those suffering from arthritis and neuropathy. The only analgesic to relieve pain with ILEX, Biofreeze features an herbal extract from the south american holly shrub. The ILEX works to extend the properties of the three analgesics contained in Biofreeze. The result is a deep, long lasting pain relief period and acceleration of the basic healing process through relaxation of stiff, aching muscles. Biofreeze has not been tested on pregnant or nursing women. We do not suggest that you use the product while pregnant or nursing. 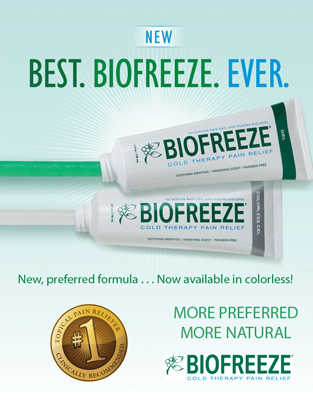 Biofreeze is gluten free. Which Biofreeze product is best for me? The analgesic properties of Biofreeze are the same regardless of which application method you choose and so it simply a matter of personal preference. The spray is a convenient no-touch way good for hard to reach areas for the patient at home, such as the upper back or neck. The gel is perfect for easy to reach areas and perfect for muscles and joints in the knees, elbows and ankles. The roll-on is a hands-free application good for hard to reach muscles and joints. Most customers prefer the roll-on for hard to reach areas, such as for the back and the neck area. How do I use Biofreeze? Best results will be felt after two to three applications of Biofreeze to the affected area. Specific instructions for applying Biofreeze are dependant on the application method you choose and are provided on the product packaging. For hot flashes, simply apply Biofreeze to the back of the neck and within minutes the body will start to cool down. Availability: Usually ships in 1-2 days on IN stock items. The majority of items typically needs to be ordered in to insure freshness. These items can take anywhere from 2-7 business days to arrive to us and we will then promptly ship your order out. Business days are considered Monday thru Friday. Customers who request immediate shipment, please call for availability. Items that are not in stock typically ship in 2-7 Business days. Our UPS packing and delivery schedule is Tuesday Thru Friday . UPS does not normally pick up or deliver our merchandise on Saturday or Sunday. We process and pack UPS daily. Packages are picked up by UPS on Tuesdays Thru Fridays usually by 4:30pm Pacific Standard Time.